Art has little to do with the transfer of a giant component. On Monday however, as ITER was preparing to celebrate Leonardo da Vinci's 500th anniversary, science, technology and industry conspired to provide a strikingly spectacular and beautiful event. As the set of trailers carrying the lower cylinder of the ITER cryostat slowly crawled out of the Cryostat Workshop, everything combined to create an awesome view: the minimalist architecture of the workshop; the cylindrical component all draped in white, and the shimmering steel of the Assembly Hall ... all against the backdrop of the intense blue of a spring sky in Provence. On 15 April, the lower cylinder is moved out of the Cryostat Workshop to exterior storage area 73 (out of the picture frame, further to the left), where it will remain until it is time to enter the Cleaning Facility (right) for integration into the ITER machine pit. 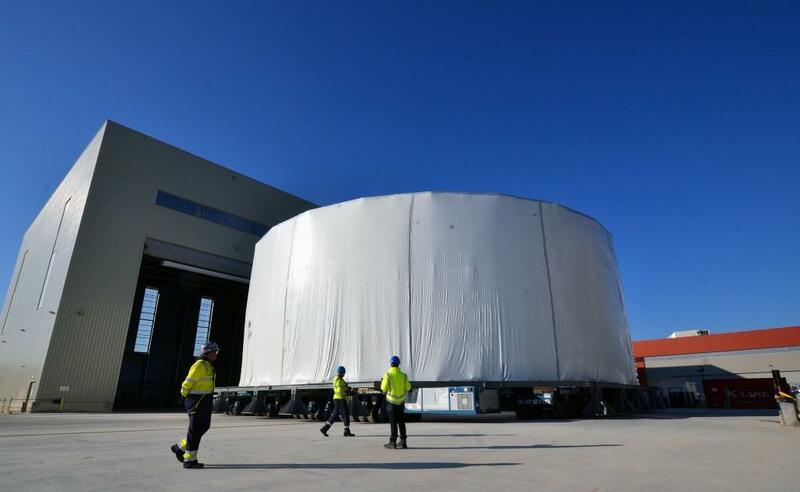 The lower cylinder of the ITER cryostat is but one section of the giant thermos that will envelop the ITER Tokamak. Standing 12 metres high, it represents one-third of the total height of the ITER machine. 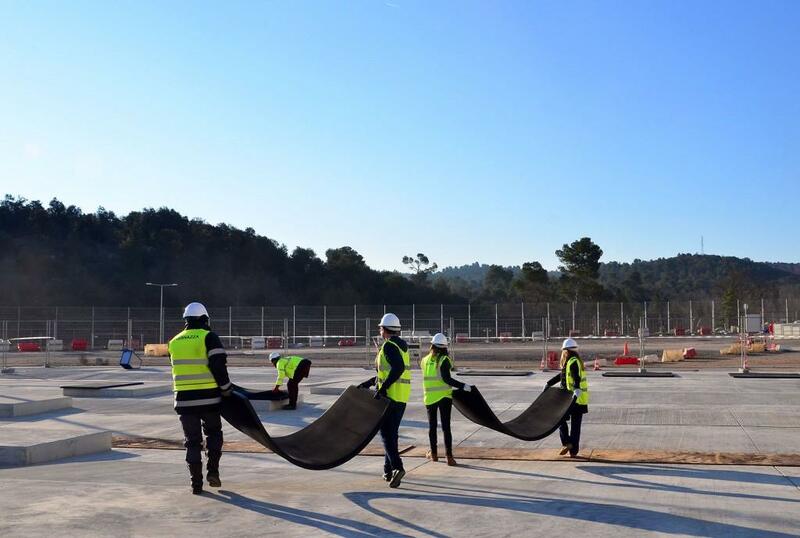 As operators stood close to it, carrying out the highly delicate transfer operation, one could measure how tall, large and massive ITER will be. Transferring the near-500-tonne load from its assembly site to the storage area a few dozen metres away required no less than four self-propelled modular transporters arranged in a square and moving in perfect coordination. Particularly impressive was the sharp 90-degree turn that the trailers had to take in order to reach the storage area—192 independent wheels slowing rotating at different angles, like small appendages of a powerful living organism. 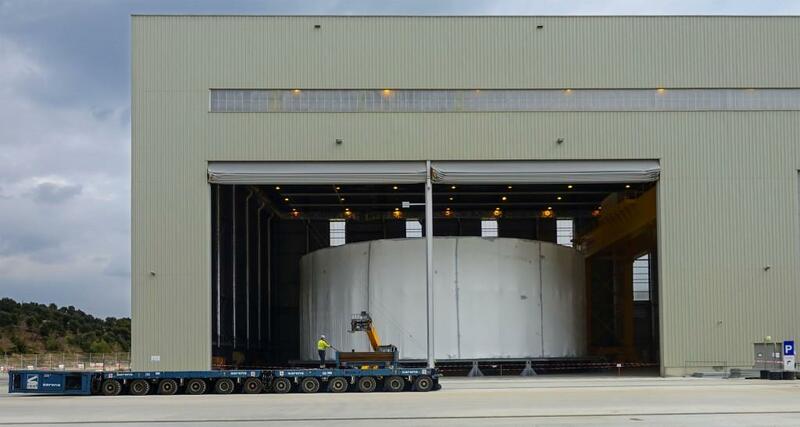 To date, the lower cylinder is the heaviest load to be moved on the ITER platform. 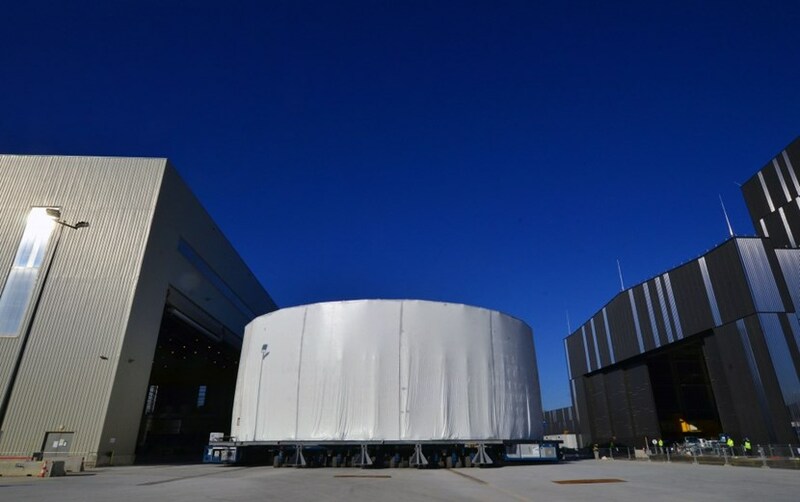 Solidly encased in its steel frame and carefully cocooned in air-tight material, it will remain in storage until the time comes to move it into the assembly pit. 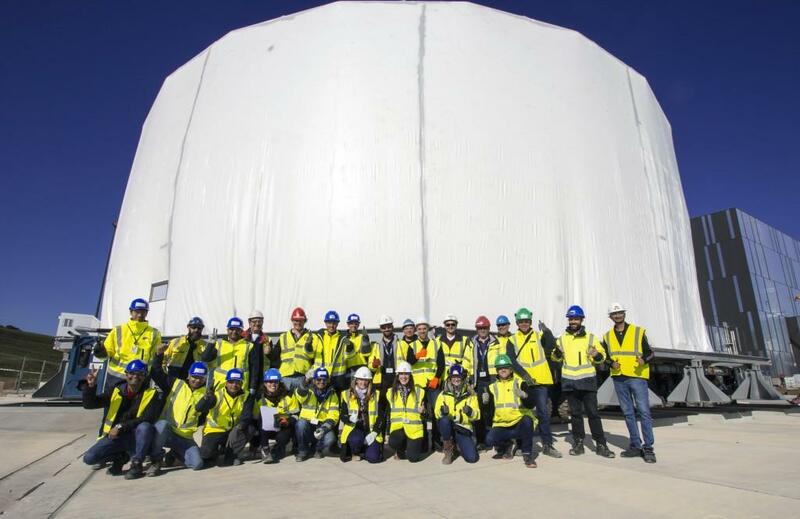 The operation on Monday was a key milestone involving a dozen stakeholders—the cryostat team; heavy load transport specialist Sarens; metrology experts from ITER; global logistics provider DAHER, and many others (see box). Transferring the lower cylinder to the storage area has freed a large working space inside the Cryostat Workshop. Soon, this space will be occupied by the assembly and welding operations for the upper cylinder whose segments are already on their way from their manufacturing location in India. 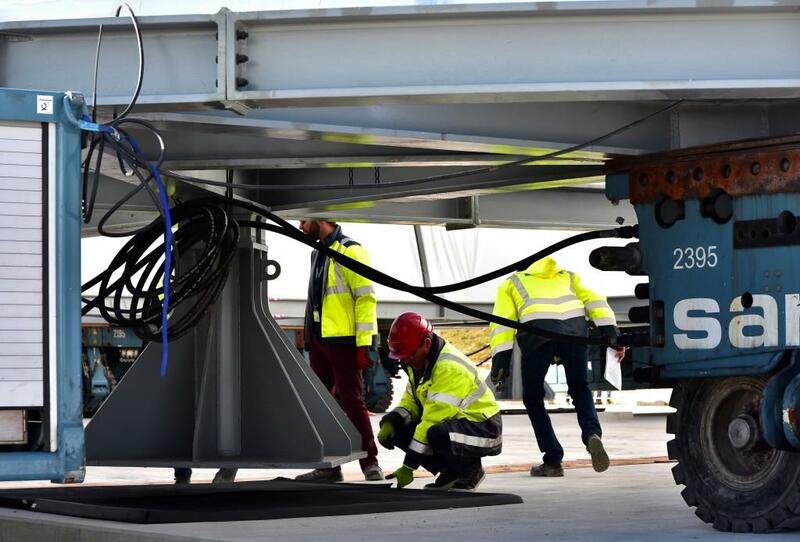 ITER Organization: Oversight, storage area, metrology, equipment rental, protection-important component surveillance; ITER's Construction Management-as Agent (MOMENTUM): Supervision, site inspections, site coordination; Cocoon Holland: Weather-proof packing, bi-annual inspection; Sarens: Component transport on self-propelled modular transporters; DAHER: Delivery of cocooning hardware to ITER, installation of shims in storage area; Indian Domestic Agency and its contractor Larsen & Toubro: Completion of cryostat lower cylinder; European Domestic Agency and its contractor ENGAGE: Management of construction work packages; APAVE: Health and Safety Coordinator. The double doors of the Cryostat Workshop open to reveal the completed lower cylinder, wrapped in its protective cocoon for storage on the platform. A space allowance of only a few centimetres exists on either side of the component as it exits the building. A few days before the transfer, transporters were delivered and assembled. Their configuration under the 490-tonne component has been carefully planned. The 490-tonne component left the building on its assembly platform, propelled by four multi-axle SPMTs (self propelled modular transporters). Everything went smoothly. Anil Kumar Bhardwaj, Cryostat Group Leader, and Patrick Petit, In-Cryostat Assembly Section Leader, watch over the transfer operation. 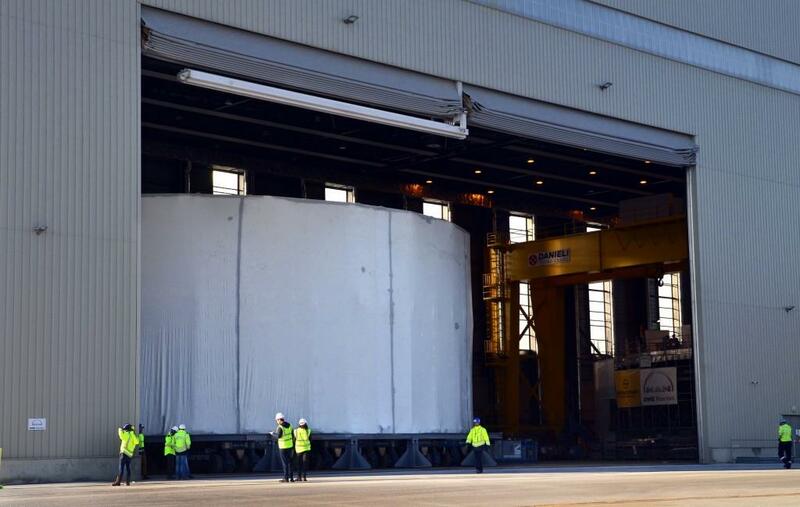 The 12-metre tall, nearly 30-metre-wide component is one of the largest "pieces" of the ITER machine. It will be stored on the construction platform until required in the assembly sequence. Shims are being installed in the storage area for reception of the component. Multiple ITER Organization, Domestic Agency and contractor teams worked in unison to successfully carry out this project milestone. Shims are adjusted under every "foot" before the assembly platform is lowered to the ground and the SPMTs are removed. With the successful transfer of the lower cylinder out of the Cryostat Workshop space has been created for the assembly of a new frame to receive the elements of the cryostat upper cylinder, which ship this month from India and are expected in May on site. 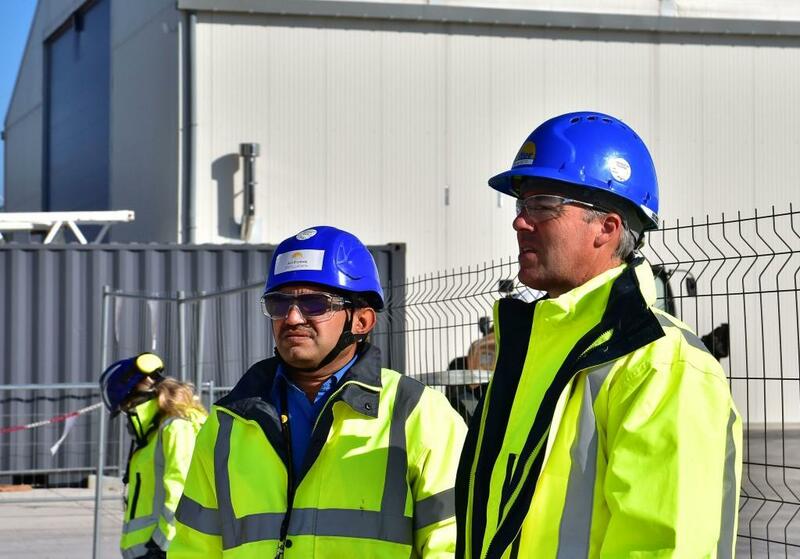 Participating in the transfer operation were members of the ITER Organization construction teams, ITER logistics provider DAHER, transportation specialist Sarens, ITER India and its contractor Larsen & Toubro, the European Domestic Agency and its contractor ENGAGE, and MOMENTUM—the ITER Construction Management-as-Agent contractor.